The Undine myth by Friedrich de la Motte Fouque was written in 1811 and served as the basis for Hans Christian Anderson's "The Little Mermaid". Later, that became the basis for the Disney movie of the same name. "Undine" is another word for mermaid, water spirit or water elemental. Undine is a mermaid who was exchanged for a human child by her uncle, a river god. She gets a soul by marrying a human and is an excellent wife. However, her husband is not comfortable with her. Although she has a soul she retains the powers she had as a water spirit. The husband's ex-girlfriend is jealous of Undine and uses the husband's fears to breaks up the marriage. Undine, rejected by her husband, returns to her underwater world, but warns her husband that he must stay true to her or she will be honor-bound to kill him. The husband, not believing this, marries the girl friend and is murdered by Undine. A very short version of this story and a misleading one. It makes Undine seem cruel when in fact she was sweet and gentle. She was forced by circumstances to kill her husband. Even after losing him she was still in love with him and had no desire to hurt him. Her husband, too, was not a bad fellow just in over his head. This is really a story about the marriage between a strong woman and a weak man. You may be surprised that a story like this was written in 1811, but it is a typical mermaid story. 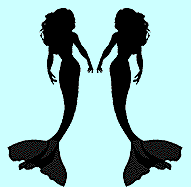 Mermaids are strong women whose relationships with men are always threatened by the mermaid's powers. Click here to read another story like the Undine myth.